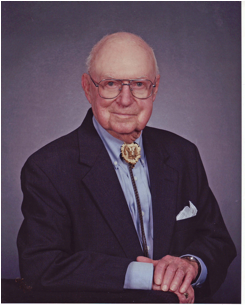 Obituary For T. S. Boggess, Jr.
Thomas Shelton (T. S. or Tom) Boggess, Jr., born March 30, 1912, died on January 29, 2010, having resided since 2008 in Phoenix, Arizona. He will be interred at Odd Fellows Cemetery in Macon, Mississippi at 2:00 PM on Sunday, February 7, alongside his wife, Alice Loraine McElroy Boggess and his parents, Thomas Shelton Boggess and Mary Belle Hicks Taylor Boggess. Boggess was their only child. A memorial service will be at the First Baptist Church on Monday, February 8, officiated by Rev. William K. Duncan. Visitation is at 10:00 AM. The Memorial Service is at 11:00 AM. In lieu of flowers, gifts may be made to the general fund of the First Baptist Church. Boggess was a significant component in the citizenry of Noxubee County, Mississippi, and of Macon. His family has roots in Noxubee County as early as 1853, when his great grandmother, Eliza L. Welborn Boggess, moved here as a widow with her children. She came to join two of her brothers, Isaac D. and William Barton Wellborn, who had been here since the 1833 organization of Noxubee County. Though the family lived in Noxubee County, Boggess was born in Texarkana, Texas, where his mother went briefly to be with her family for the delivery. Boggess was raised a gentleman in Noxubee County, and his life was filled with accomplishments, including, in 1926, being the first to achieve an Eagle Scout award in Noxubee County. A highlight was the 6,000-mile trip touring the West in 1929. In 2008, he met with President George W. Bush to honor four generations of Eagle Scouts in the family. He attended Mississippi State University, graduated from Louisiana State University in bio chemistry, and was a Kappa Alpha. Boggess met Alice McElroy, who became his bride September 4, 1935. He took a job in 1937 with the University of Georgia Food Science Division and created quite a reputation as a published scientist in his two tenures there, 1937-1947 and 1958-1974. He was a member of Kiwanis Club International and served as Governor of Georgia Kiwanis Clubs. In Macon, he was a member of Rotary Club International, Frith Lake Club, Magnolia Club and the Macon Golf Club. The family�s church life centered in the First Baptist Church of Macon, where he served as a Deacon and an adult Sunday School class teacher. Boggess was King of the Macon Junior Auxiliary in 1998. In 2004, Mississippi Blue Cross Blue Shield Insurance Company honored Boggess by his being chosen one of four outstanding older citizens noted as the Ageless Wonders. His fame as a vintner and private winery operator is famous in Mississippi. Boggess is survived by his daughter, Suzanne Margaret Boggess Sharpe of Aurora, Texas, her husband, Dwight Albert (D. A.) 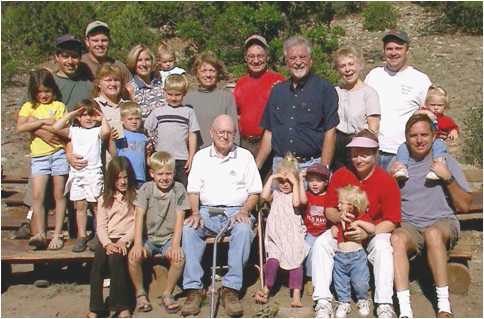 Sharpe; son, Dr. Thomas Shelton (Doc) Boggess, III of Camp Verde, Arizona, wife, Lindley Jones Cheatham Boggess. Mr. & Mrs. Sharpe have three children: Taylor Marcus Sharpe; Tiffany Lenn Sharpe Westmoreland, husband Steven O. Westmoreland, children Katie, Jack, Lily, Sarah and Sam; son Todd Wittman Sharpe, wife, Carrie Ann Maxwell Sharpe, children Luke and Brooke. Dr. and Mrs. Boggess have two children: Frances Barton Boggess, husband Andres Gallegos, children Lindley, Rachel and Adela. Thomas Shelton Boggess, IV, wife Jonette Lyn Davis Boggess, children Shelton , Bennett, Davis and Katie. He concluded his life, there were 15. 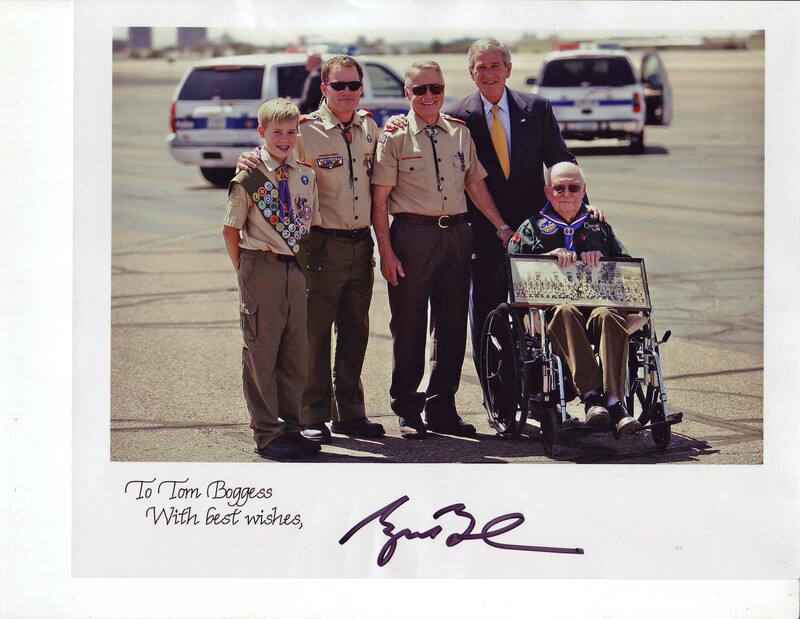 President George W. Bush greets the four generations of Thomas Shelton Boggess Boy Scout Eagle Scouts. The location was out on the tarmac at the International Airport in Phoenix, AZ near where Air Force I had just parked (April 2008).